Coach Vern Friedli holds the record for the most wins (166) of any Tucson area high school. He also holds a special place in the hearts of his players at Amphitheater High, where he has been head football coach. A football, basketball player himself during high school, this Honors Graduate of the University of Arizona started coaching at Sunnyside Jr. High in 1961, and later held championship coaching assignments in Morenci, Casa Grande, and San Manuel. 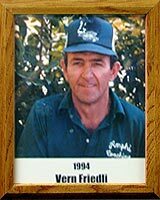 Vern holds such titles as South All Star Coach; Arizona Daily Star and Tucson Citizen Coach of the Year and Arizona Republic All State Coach of the Year, Among many others. He has also received the Tucson Conquistadores Special Recognition Award for football and baseball and the Outstanding Educator of America Award. A member of both the National Education and Coaches Associations, Vern was inducted into the Arizona State Coaches Association Hall of Fame in 1986. Coach Vern Friedli has been an inspiration to youngsters both on and off the field.